It was a broadly bullish week for US equity indexes, with net weekly changes ranging from +1.6% (Dow), +1.2% (sp'500), to -0.3% (Transports). Near term outlook offers a 3-4% down wave. Broadly, the US and almost all other world markets remain very strong. 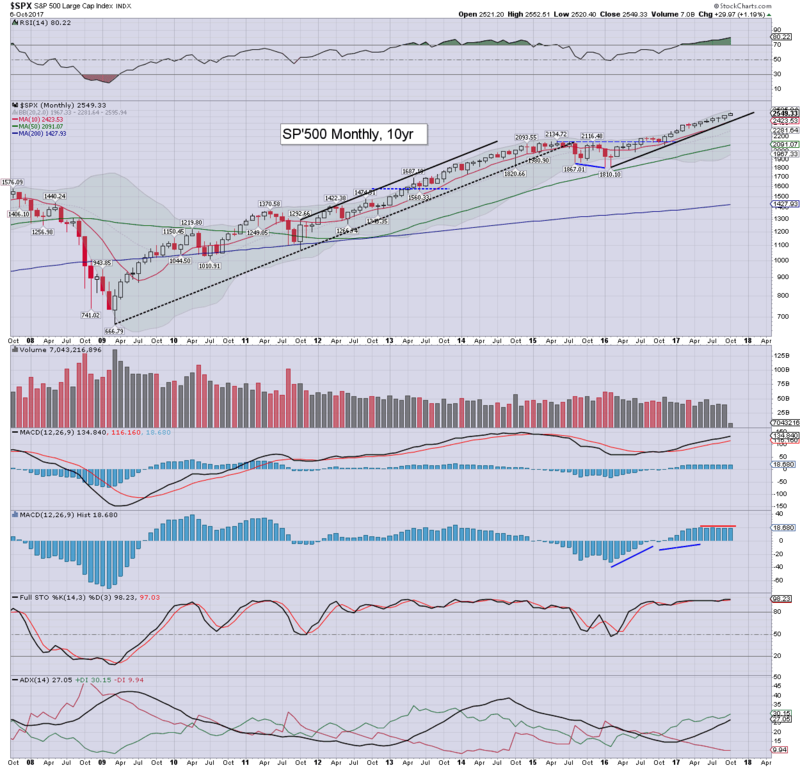 The sp'500 is currently net higher for a seventh consecutive month, +1.2% at 2549, with a notable new historic high of 2552. Underlying MACD (blue bar histogram) is effectively flat lining at what is the high side. 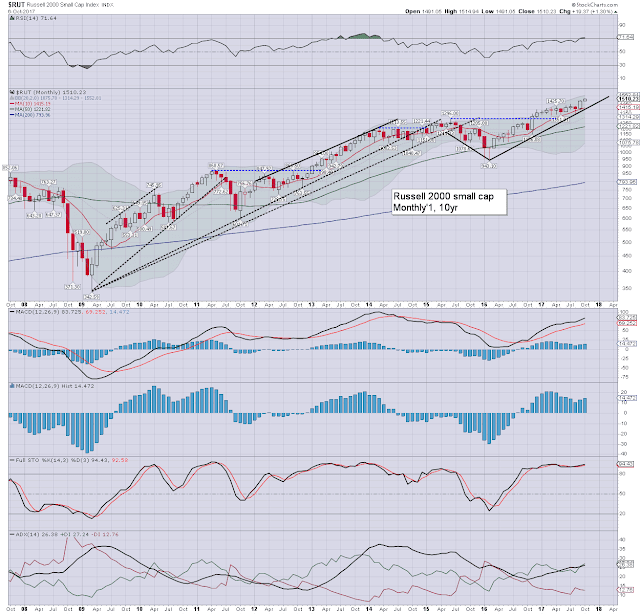 RSI continues to increase, and is now at 80, the highest level since (at least) spring 2007.The key 10MA is at 2423, and is rising around 35pts a month. At the current rate, my personal 'line in the sand' will be around the 2500 threshold from the Dec'1st open onward. Best guess: near term cooling of around 3-4% to the gap zone of 2474/61. No sustained price action <2460, with the 2600s due by late November. My year end year target of 2683 is just about within range. Equity bears have nothing to tout unless a monthly close under the 10MA. Frankly, that looks extremely unlikely before year end, as the US/world economy continues to grow. The Nasdaq comp' is currently net higher for a fourth month, settling the week +1.4%, at a new historic high of 6590. Note the key 10MA at 6160. Unless the bears can decisively break <6100, there is little reason to be mid term bearish. Recent price action is strong, and the 7000s are within range before year end. 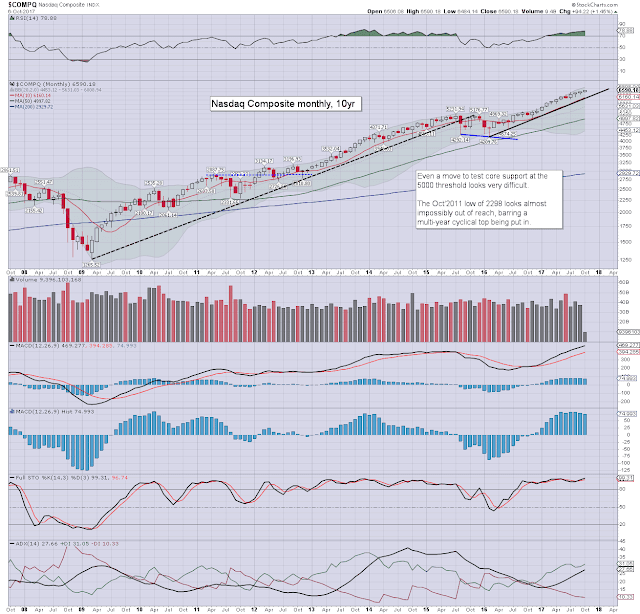 Talk of COMPQ at 10k should have already begun. The mighty Dow is currently net higher for a seventh month, settling the week +1.6% at 22773, with a new historic high of 22777. Note the key 10MA in the 21300s, which will offer very strong support across Q3 earnings and into early November. Rising support from early 2016 is currently around the 21k threshold. A test of the 20k threshold looks extremely unlikely unless some major geo-political 'shock'... which would most likely come from North Korea... or Catalonia/Spain. The master index is currently higher for a second month, +0.8% at 12317, with a notable new historic high of 12351. Rising support is around 11800. 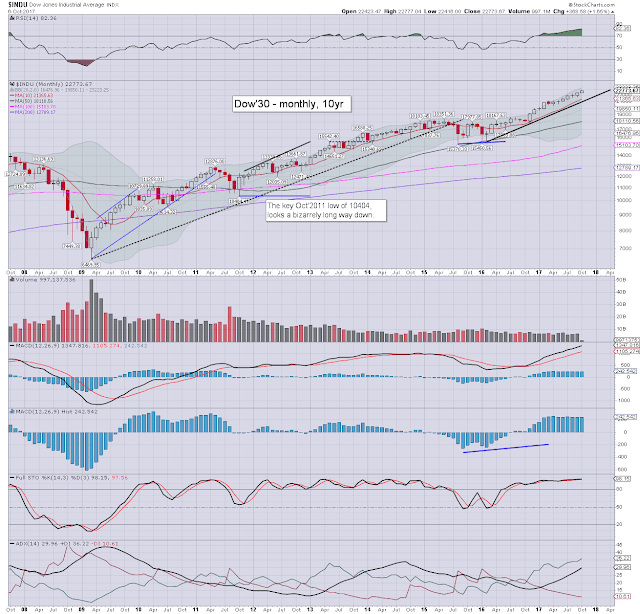 Things would only turn bearish with a monthly close in the 11600s. The second market leader - R2K, is currently net higher for a second month, +1.3% at 1510, having seen a new historic high of 1514. Upper bollinger is offering the 1550s in the near term. 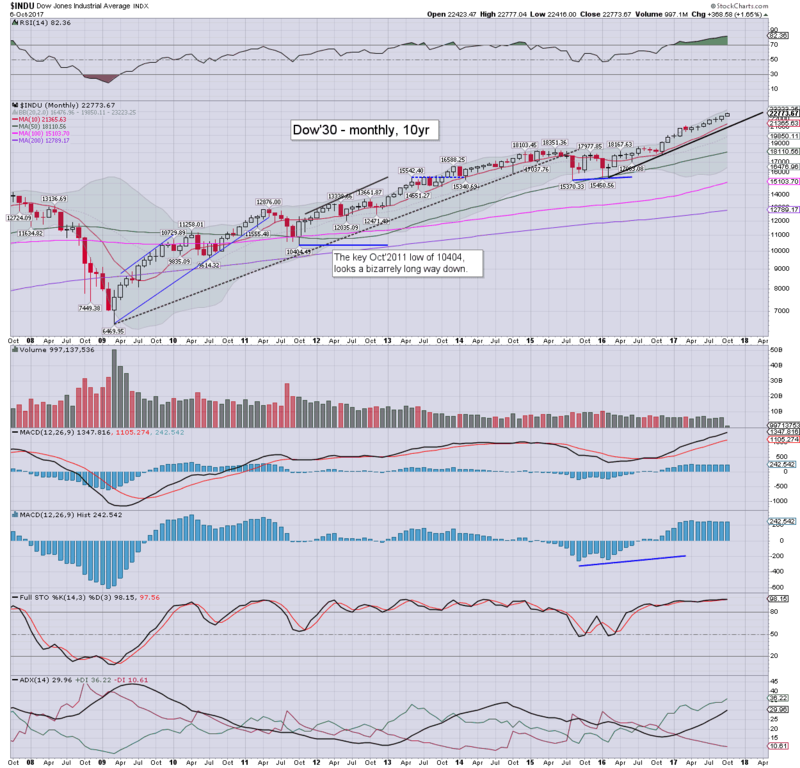 A year end close in the 1600s is seemingly probable. The 'R2K @ 2K' is a valid target for mid 2018. 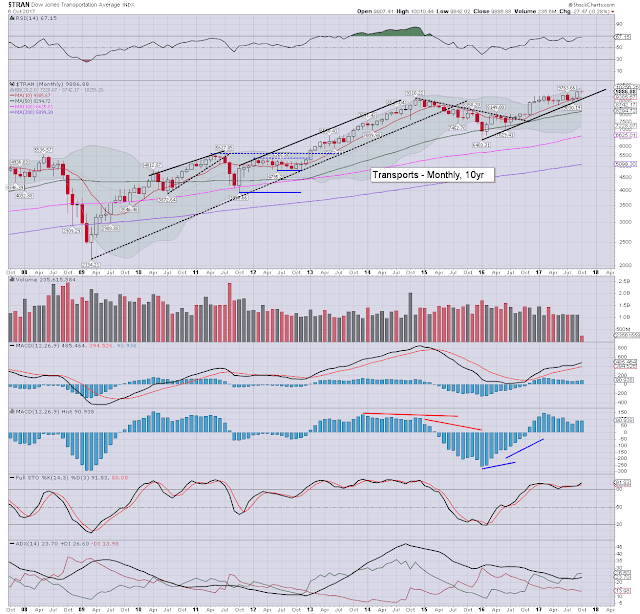 The 'old leader' - Transports, saw a net weekly decline of -0.3% at 9886, however there was a notable new historic high of 10010. The new high decisively broke a rather tight trading range (much like 2012), and it bodes very bullish for the mid term. 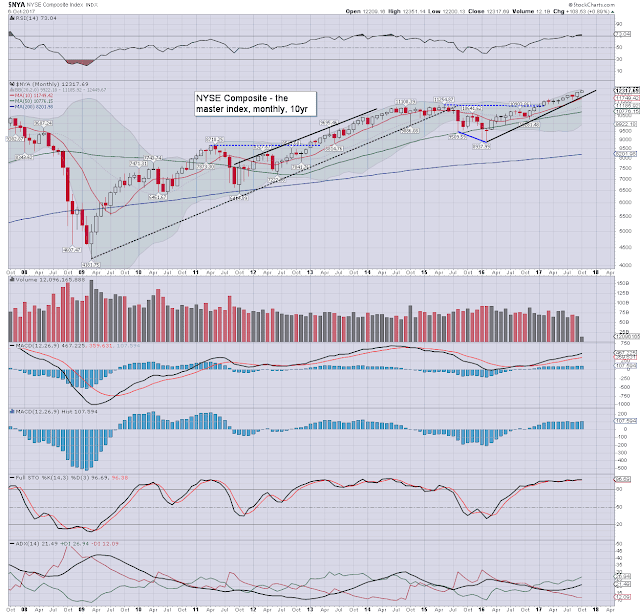 The 11000s are just about viable by year end, and that would arguably equate to the sp'2650/700 zone. 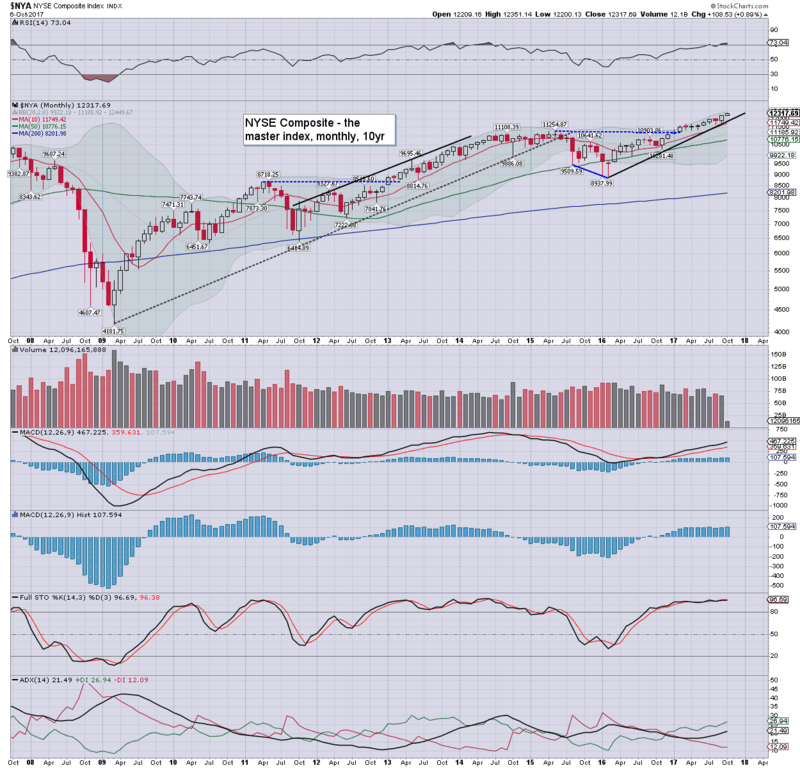 The first week of October saw all six main US indexes break new historic highs. The Transports and R2K, having been broadly stuck for the year, have both decisively broken upward, and this bodes strongly bullish for the broader market into 2018. All US indexes continue to have downside buffer of around 5%, before their core upward trends from early 2016 would be challenged. The first half of the week is practically empty, and even though Monday is 'Columbus day', the US market will be open as normal. Q3 earnings will arguably kick off on Thursday, with JPM and C. Friday will see BAC and WFC. *there are 9 scheduled fed official appearances, although none really appear particularly important, as the fed have already telegraphed (via various media outlets) that they will raise rates at the Dec'13th FOMC.